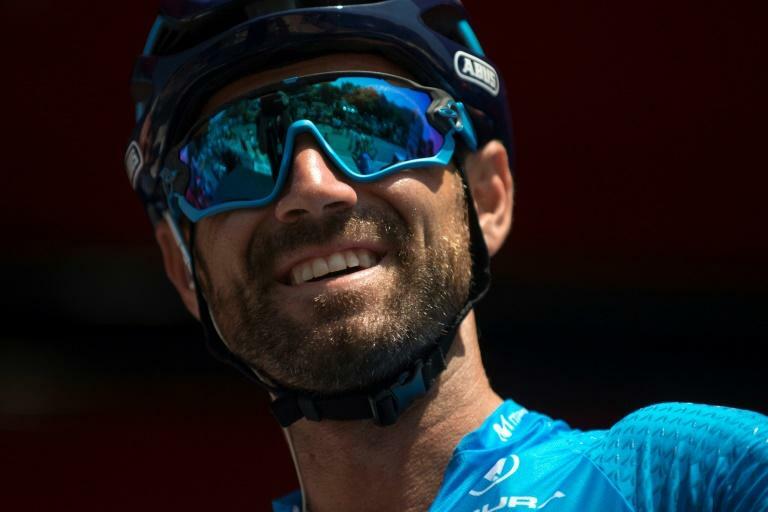 Spanish veteran Alejandro Valverde spread his arms wide in victory atop the summit finish on stage two of the Vuelta a Espana on Sunday as the man he pipped, Sky's Michal Kwiatkowski, took the overall leader's red jersey. Australia's Richie Porte, along with his BMC teammate and overnight leader Rohan Dennis, plus the world champion Peter Sagan were part of a group that finished several minutes behind after both Sky and Valverde's Movistar set a punishing late pace. Seven riders formed an early escape group as the peloton exited the Costa del Sol resort of Marbella in temperatures of 32 degrees Celsius. French pair Alexis Gougeard and Pierre Rolland held out until Sky and Movistar reeled them in with 20km to go in a burst of speed that splintered the peloton. Defending champion Chris Froome and Tour de France winner Geraint Thomas are not taking part. The real action of the 163.5-kilometre run from Marbella to the hair-raising cliff-side wooden paths known as the Caminito del Rey in Andalusia's Sierra Madre foothills began on the final short climb. Kwiatkowski attacked with 500m to go with Valverde and Adam Yates swiftly on his tail. But Valverde, whose team captain Nairo Quintana led him up the hill, took control in the final 100m with Quick Step's Laurens De Plus coming third three seconds adrift. "I let him (Kwiatkowski) go and then went after him on the last corner," explained 38-year-old Valverde. "I've now achieved my objective here and will take it day by day now," added Valverde, who is targeting the world championships road race in late September, which has a similar finish to this second stage. Poland's Kwiatkowski expressed his disappointment at missing out on the stage despite clinching the overall lead. "He was unbeatable today, so congratulations to Alejandro. I took the red jersey but doing that without winning the stage leaves me with mixed feelings," he said. Kwitakowski should now hold the lead on Monday's stage as he leads the race by 14sec from Valverde in second while Sunweb's Wilko Kelderman is third at 25sec.